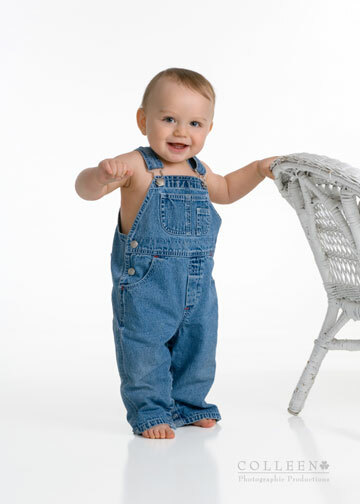 Babies go through so many changes within the first year, from a tiny, helpless infant to a busy, exploring toddler. 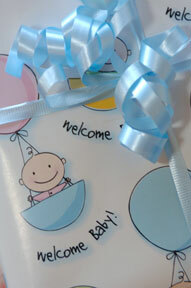 My baby plan is a great way to help busy parents make sure they don't miss documenting the important milestones. 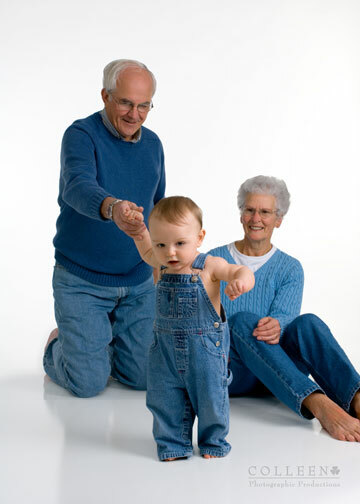 For Jack's 9 month session we included some portraits with his grandparents. 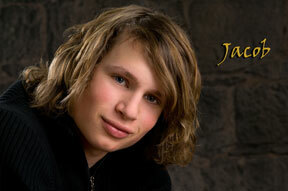 I love photographing high school seniors! So many creative possibilities. Here's a slideshow of images from a recent session of Jacob He was great to work with and I'm looking forward to his outdoor session this summer. Thanks for inviting me to your baby shower, Felicia! It was fun to see everyone and your beautiful new home. I'll see you soon for your maternity portrait session. 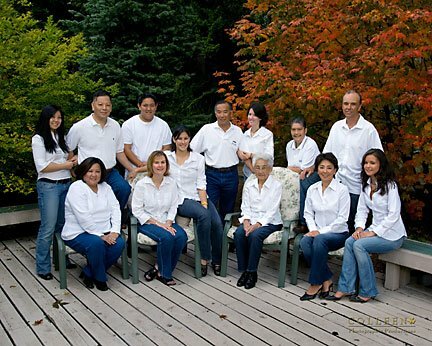 I recently had the pleasure of creating portraits of the Iwasake family as a gift for Grandma's 80th birthday. 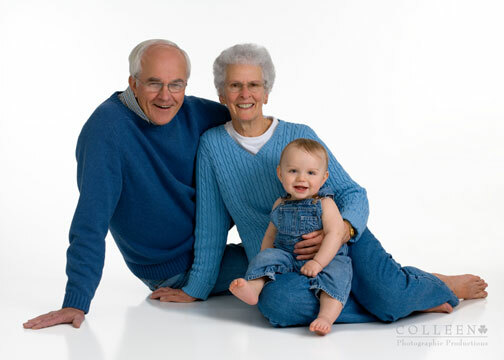 They are such a nice family and Grandma is spry and cute. It is so important to make time to capture these memories to pass on to the next generation. 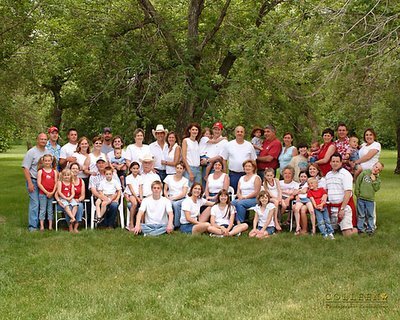 Here's a portrait I did of my family during our reunion in Mandan, ND last year. 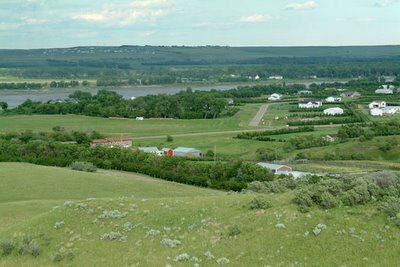 Here's a view of the farm where my dad grew up, taken from the top of Seashell hill where they have found seashells in the dirt. 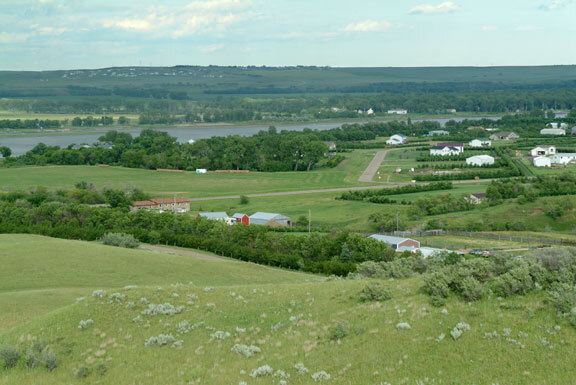 The family farmland has been subdivided and sold for the houses you see in the background. Kinda sad but you make more money than farming it. 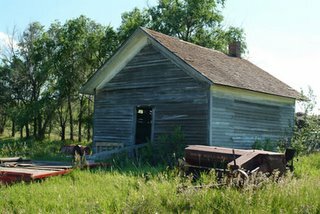 I remember driving out to the farm when I was a kid and all I saw was a few houses here and there, getting all excited when I finally spotted our farm. When I drove out this time it was a little confusing as I saw houses everywhere and had to really look to make sure I went to the right one. 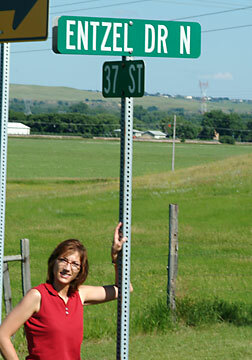 My uncles had naming rights for the subdivision streets, here's me next to a sign with the family name. This is the one room schoolhouse that my dad attended. It was fun to show that to my kids. I received a call the other day from a woman interested in my baby portraiture, and the first question she had was whether I shoot digital or film. Her friends wedding was photographed digitally and the image quality was poor, so she thought she better have her baby portraits photographed with film. I explained that a professional who knows what they are doing should be able to produce wonderful images whether photographed with film or digital media. Professional level cameras provide a higher resolution image, and if the files are handled correctly, there should be no problem. The newest digital SLR's equal that of scanned 35 mm film in image quality. There are many factors needed to produce quality digital images and I'm actually amazed that the average person can get a decent image with their little point and shoot camera and their home printer. I have spent many hours learning about proper file management, color managed workflows - meaning calibrating the computer monitor with the printer or lab, and Photoshop image manipulation software. She mentioned that her friends photos looked distorted, which sounds like they were resized incorrectly. Do you know that every time you open and adjust a jpeg file you degrade the quality? That is why a pro always saves the original file as is, in essence that is the "negative". Then any adjustments are made on a duplicate file, sized and re-saved. Also, when images are re-sized they get fuzzy and need to be sharpened. Then if you open that image, re-size it and sharpen it again, it can start to look ugly really fast. Digital images do have less shadow to highlight tonal latitude than film, which requires capturing the image properly so as to avoid overexposed highlights as well as "noise" in underexposed shadow areas. But the benefits of digital capture are many. My "darkroom" is now the computer on my desk. I can retouch, darken and lighten, adjust tone and saturation with much more precision. There are wonderful creative image adjustments I can make such as tones like sepia or blue, hand colored effects, ultra saturated, high contrast and much more. Then there is the ability to create collages of multiple images for wall decor and albums. If you are still not convinced, stop by to view my work and see for yourself. There is no charge for a consultation and we encourage a planning appointment so that we can discuss ideas and design a session to achieve the results you desire. Hey, I'm liking the colors on this blog. I'm going to be refreshing my website and thinking of incorporating the sage green. What do you think? I'm excited to make my first post on my new blog. I'm not sure I know what I'm going to do with this but I'll figure it out as I go. I hope for this to be a place to post about what's new at my studio and other items of interest. Here's one for ya. Of course I include basic retouching (and often beyond basic) in my portraits so that my images, and the subject, looks as good as possible. I spend many hours in front of the computer working on images. All that seat time is also why I've had to get serious about working out every day! Anyway, I found a website by a company that provides retouching on many photos of celebrities and they have some awesome examples of their work. Check out the before and after section and you will see the extent to which people are transformed. www.fluideffect.com They have bumps and wrinkles just like the rest of us, all those flawless models in magazines really aren't, it's all an illusion of (for most of us) unattainable perfection.